Loco moco is one of those unique dishes in Hawaii that are ubiquitous at home and often taken for granted. When I moved to the mainland it was one of the first dishes I had to learn to make on my own. I’m no slouch when it comes to cooking but local food in Hawaii was always available for cheap within 5 minutes from anywhere so I always grabbed it at a lunch wagon, at a drive-in, at a food court, or a hole in the wall, and I never really bothered to learn how to make it. No longer having easy access to it however I knew that I would have to learn how to make it. The craving for the flavor explosion in the mouth that happens when the hamburger patty, gravy, and runny egg yolk come together drove me to experiment with recipe after recipe until I finally came up with one that works for me. 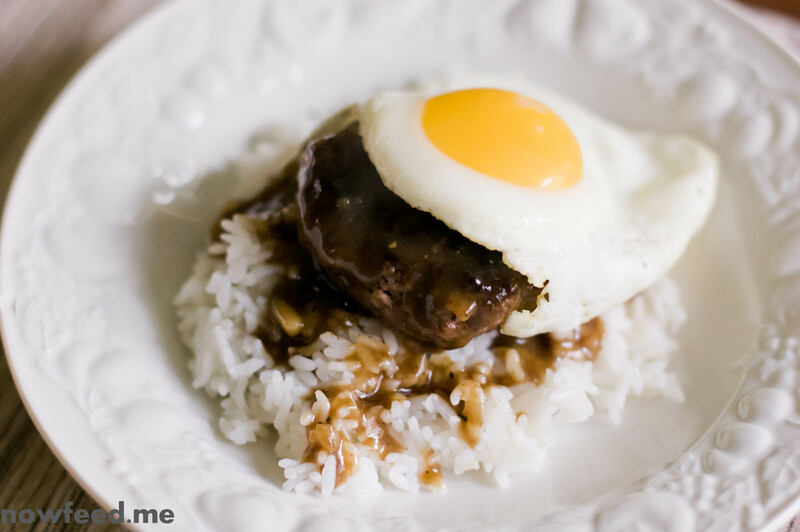 While all recipes are seemingly always a work in progress no matter how good they are – and because I often make do with what I have on hand rather than run to the store for just one ingredient – here is Loco Moco as I make it today. In a bowl mix the ground beef, onion, salt, and pepper and form the patties any way you want to. I form them with my hands, about 3 1/2 inches in diameter and about 3/4 inch thick. Preheat a pan on medium-high, about 6 on my electric stove, then add the oil to the pan and allow to heat for about 20-30 seconds, or until the oil begins to shimmer. Fry the patties for about 3 minutes per side for just well done. When the patties are done remove them from the pan and deglaze the pan with a little beef broth, then pour the rest in. Add one or two dashes of Worcestershire sauce and let the sauce reduce for a few minutes, until almost reduced by half. Mix the flour with a few tablespoons of water and slowly add about a tablespoon or two at a time and mix well allowing the sauce to thicken. When it is the consistency of gravy that you like simmer the sauce for a few more minutes to cook out the taste of the flour. 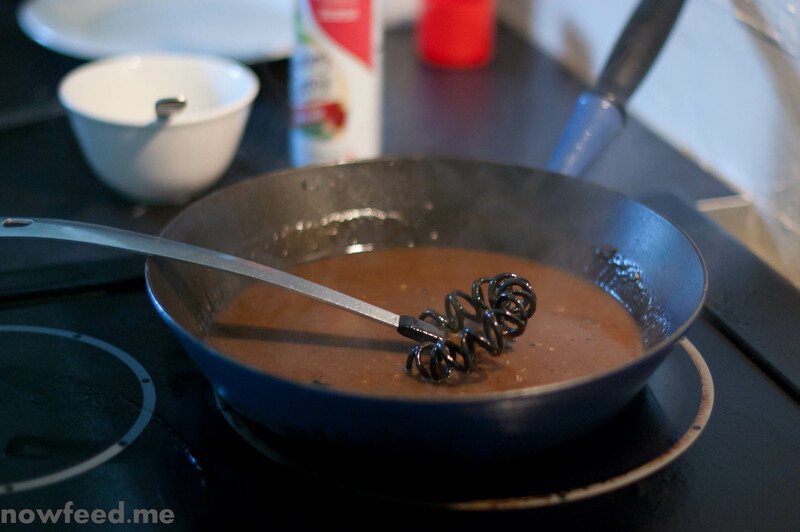 If you want to get fancy add a tablespoon of butter at the very end and mix it in well to give the gravy a little sheen, like in the restaurants. Usually right around when the patties are done I begin to cook the eggs in a separate pan, sunny side up allowing for one egg per dish. Cook them low and slow so they stay soft as you want the yolk to ooze all over when you break it. When the patties, gravy, and eggs are done it’s time to build the loco moco. 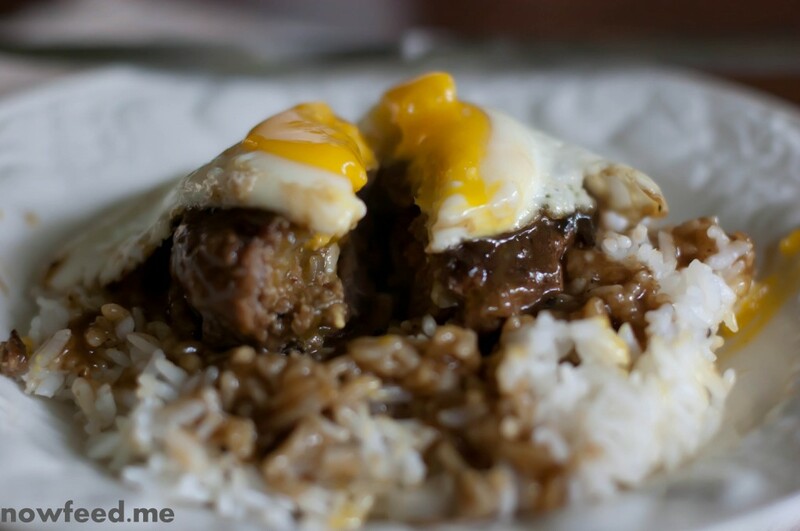 Put one or two scoops of rice in a dish or bowl, place a pattie in the middle, ladle some gravy over the beef and a little over the rice, then place the egg on top. Dig in! 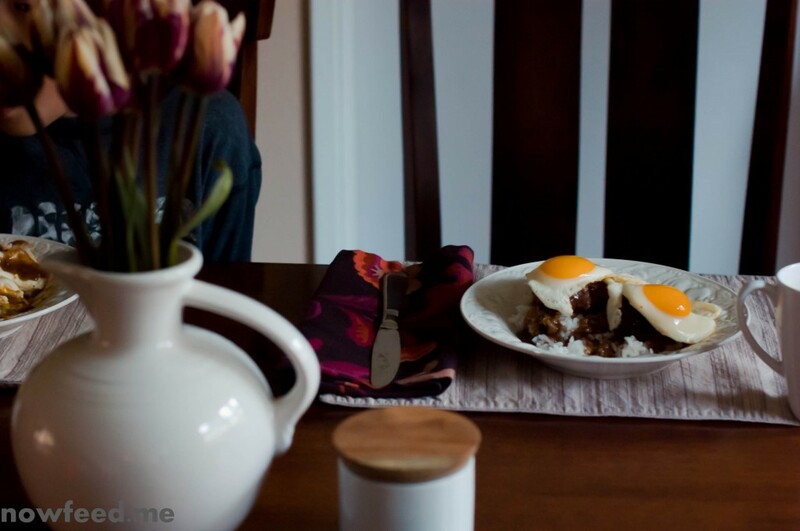 Hungry man’s alteration: Use a little more beef and a few extra eggs to make an extra beef patty and egg per dish. You will need two frying pans for this dish so have them both ready. Preheat the pan you use for the eggs (on about 4 1/2 – 5 on my electric stove) for a couple of minutes right before you take the patties out of their pan so you have time to cook the eggs low and slow. Remove the ground beef from the refrigerator about 15-20 minutes before you begin to bring it closer to room temperature. Besides making it a little to form the patties the beef will cook faster and more evenly in the pan. 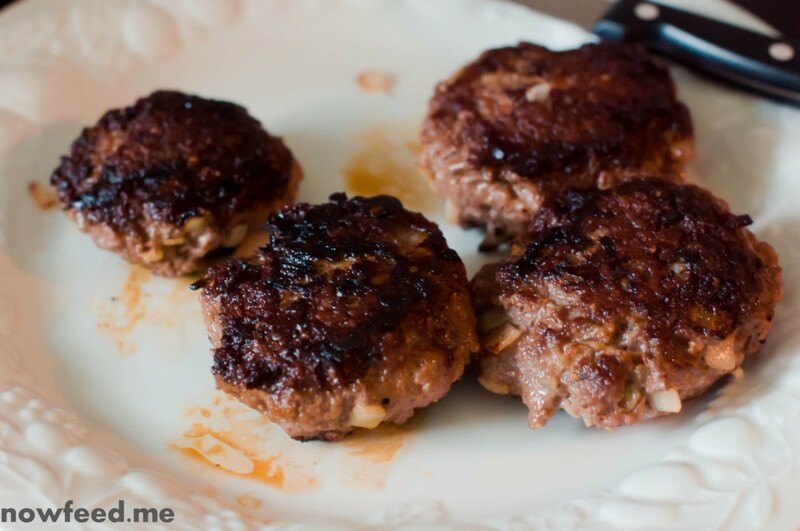 Using cold meat will make for longer cooking times and a less juicy patty. Make use of your oven to keep patties and eggs warm. This is something I always do when food finish cooking at different times. Set your oven to the warm setting, if it has one, or around 160 degrees Fahrenheit. Place the patties in the oven on a plate when they are done, and do the same with the sunny side up eggs as well. Don’t crowd the eggs in the pan or the whites will cook into each other. 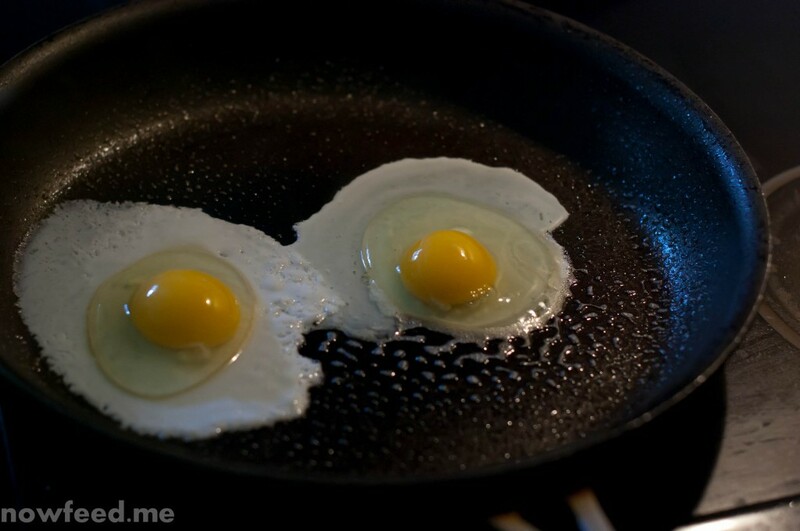 Cook fewer eggs at a time to keep them separate, but keep the cooked eggs warm until you are ready to plate. In place of flour use a gluten-free flour mix – which I did the day I made this for breakfast – or other thickener such as corn starch, arrow root, etc. I prefer flour myself. Use Lea & Perrins Worcestershire sauce which is gluten-free in the United States, or any other brand labelled as gluten-free. My understanding is that the Canadian and British versions are not gluten-free. This entry was posted in Food, Recipes and tagged beef, Hawaiian. Bookmark the permalink. It’s been too long since I’ve made these…better remedy that and soon. You should! We go a while without making loco moco an then one odd morning the mood will strike and it’s what’s for breakfast. I just saw this on Hawaii 5-0 and looked it up – it looks great, and I will definitely add it to my recipes.